Whether you are looking for a gift this holiday season or just wanting something special for that holiday party, Irresistible Me has you covered with hair accessories, extensions, hair tools and even shampoo and conditioner to get your look started! Getting ready for a holiday party takes a lot of planning especially when it comes to your outfit and accessories. The last thing you need is frizzy, damaged hair to ruin the gorgeous look you've created. Lately I've been loving Irresistible Me's Liquid Gold shampoo and conditioner. Not only does it smell amazing, but my hair feels smoother just by using the shampoo. That's pretty impressive considering my hair is thick, color treated and prone to extreme frizz this time of year. 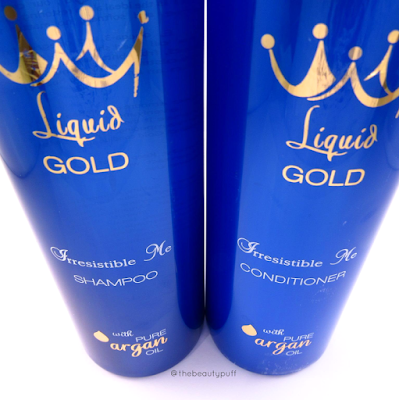 These products both contain organic argan oil which helps smooth, soften and moisturize hair. Giving your hair a head start with using a great shampoo and conditioner means you can rely less on hair styling products to smooth your hair and provide shine. All I have been using lately is a very small amount of hair serum to protect my hair while blow drying and that's it! I'm left with soft, hydrated, lovely locks that aren't weighed down with heavy hair products. What better to finish off a look than with gorgeous hair accessories? Irresistible Me has a beautiful selection of bobby pins, headbands and hair combs to add the perfect touch to any holiday look. For a versatile piece that can be worn with a casual outfit, or dressed up, the Clara Bobby Pin is a great choice. 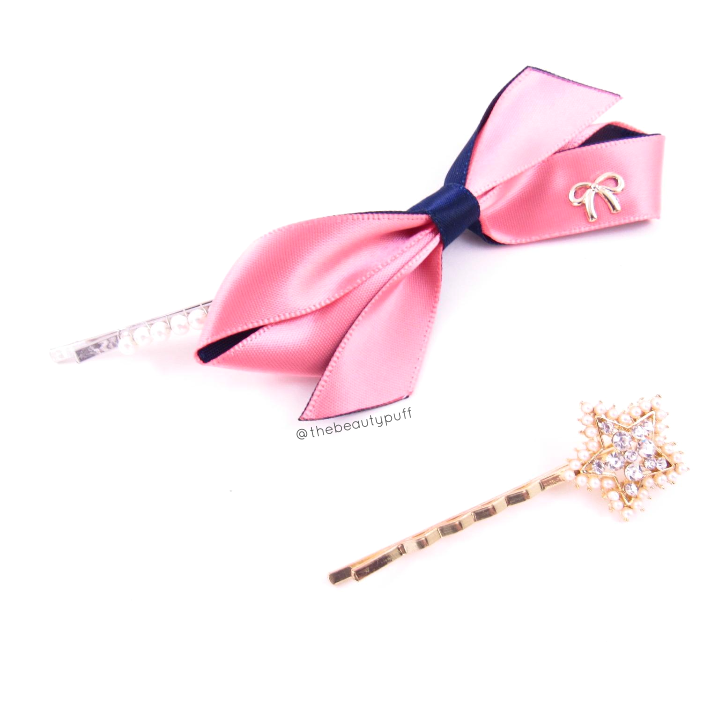 It is longer than a typical bobby pin so it will stay put even in long, thick hair. 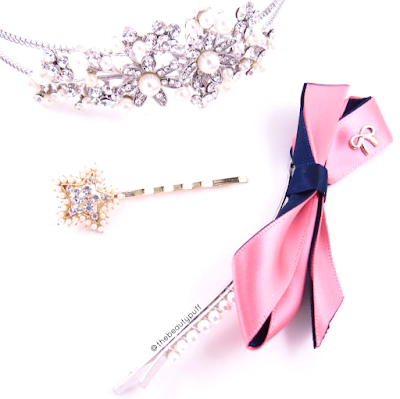 The pin has small pearl accents with a pink and navy bow for a classic, yet feminine touch. If you want a bit more sparkle without going overboard, you'll love the Alice Bobby Pin. This one is right up my alley. The star makes it a festive addition to any holiday ensemble. 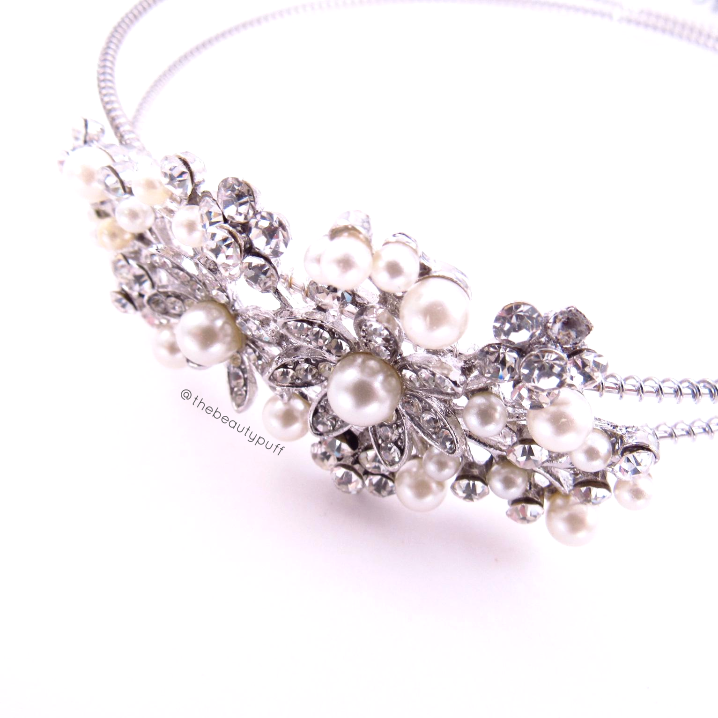 It is outlined with tiny pearls and filled with mini rhinestones for a glamorous touch. It adds just the right amount of sparkle without drawing attention away for whatever outfit you have planned! They also offer different shapes including a crown, tiara and bow. If you plan to go all out for your holiday gatherings this year, look no further. The Isis headband is a real showstopper! It has elegant flower detailing with mini pearls and rhinestones that will pop against any hair color. This headband can be paired with a variety of looks, from sparkly sweaters to festive dresses. It's a great piece to have on hand for other special occasions too! IrresistibleBeautyPuff saves you 10% at checkout!